Panasonic has finally confirmed the official release of the much talked about 12-35mm f/2.8 X lens, which will cost around £1,000. After announcing the development of the lens, earlier in the year, much excitement surrounded the optic - which is the first Micro Four Thirds zoom lens to offer a constant aperture of f/2.8. Compatible with Panasonic's G range of cameras - as well as the Olympus PEN and OM-D range - it offers an equivalent of 24-70mm in 35mm terms, a classic zoom lens choice for full frame users. Constructed from metal, the lens is manufactured in Panasonic's Yamagata factory in Japan, which is intended to reflect the firm's commitment to the quality of the lens. Although it bears the name X, as the 12-42mm power zoom lens, it features a standard zoom function - as in by twisting a central lens ring - it does feature Power Optical Image Stablisation though. It's water and dustproof, with Panasonic expecting that the majority of sales will come from G3, GH and GX users. 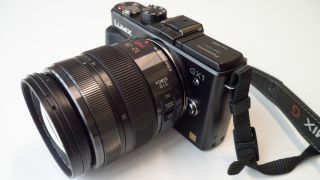 As it doesn't use a power zoom, Panasonic says that the lens is aimed at stills photographers, more than videographers. The new addition brings the total of Panasonic Micro Four Thirds (MTF) lenses available to 16 - giving MFT a much larger range than its rivals from Sony, Nikon, Pentax and Fuji. The Panasonic 12-35mm f/2.8 'X' lens price will be around £1,000 and it will be available from the end of June.